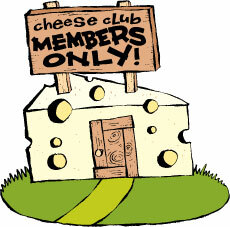 Artisan Cheese Club for sale. Buy online at Zingerman's Mail Order. Gourmet Gifts. Food Gifts. From dairy to cave to table. Our original cheese club—and still our most popular. In this club we go country to country through six traditional cheese cultures. We taste cheeses subtle (like northern Italy's cave aged Fontina Val d'Aosta, the truffle of the cheese world), cheese emphatic (like Switzerland's mountain cheese called L'Etivaz, made in eighty pound wheels) and cheeses rare (like the only raw milk Stilton left in the world). The tour is extensive but never tiring. These are the cheeses like you've never tasted before. Weighing in at over a pound and a half per shipment they'll last the recipient for weeks-just in time for next month's delivery. Bonus: Copious notes, stories and serving suggestions included.